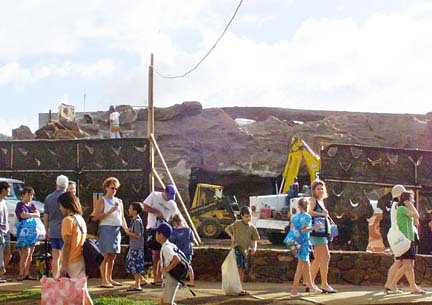 Hanauma Bay visitors lined up Friday to enter the park in front of structures being built by the city. Design changes have postponed the project's completion to late March. A number of design changes have added to the cost of the city's controversial $10.6 million improvement project at Hanauma Bay Nature Preserve and pushed the planned completion date back to late March from November. But officials in the administration of Mayor Jeremy Harris have not released costs or other details associated with the change orders. Councilman John Henry Felix, who represents the East Honolulu region, wrote to Managing Director Ben Lee on Nov. 19 requesting "a financial analysis of cost overruns and the number of change orders and the reasons for the changes regarding the Hanauma Bay reconstruction project." Felix said yesterday that he has not yet received the information although both Harris and Rae Loui, the city's director of design and construction, assured him in mid-December it was forthcoming. Felix said he did not know why it has taken so long to get his answers. "It's not difficult, because every change order requires a written request, and they should all be documented," he said. "It's all a matter of public record. The public has a right to know their tax dollars are being used appropriately." Felix said he has been told the project has overruns, "but I don't know and that's the problem. We can only surmise that that is the case." Last week, the Star-Bulletin also requested copies of all approved and pending change orders involving the Hanauma Bay project. Lee said yesterday he would provide copies of approved change orders tomorrow. He said he will not release information involving pending change orders that are subject to negotiation until they are finalized. The administration has not forwarded the information Felix requested because "I got incomplete and inaccurate information from Design and Construction," Lee said. Some of the information Felix was to get showed changes as being approved when they had not, he said. Lee said he does not believe the project is over budget, but emphasized he cannot say for sure at this point. Some of the details and costs of the change orders have been made public. In May the administration agreed to lower the height of the marine education center and snack bar buildings on the upper portion of the park. The $80,000 change lowered the buildings by as much as five feet. The East Honolulu Community Coalition has objected to the height and sightliness of the upper park buildings. Lee said the construction is nearly done and that only "finish work" needs to be done on the upper bay. Lee acknowledged some of the other changes, including relocating the information pavilion on the lower portion, burying utility wires, simplifying the education center's roof structure, eliminating skylights and adding air conditioning. But he had no immediate costs for those changes.